Will More Teachers Smash Boundaries Under Compulsory ‘LGBTQ’ Lessons? (Linda Harvey – Mission: America) The door is now wide open in many public schools for corrupting teachers to enter and poison the minds and bodies of impressionable children. Most teachers try to do what’s right, but with so-called “non-discrimination” school policies in place, sexually immoral adults or pro-abortion/“LGBTQ” activists cannot be barred from classroom access to children. And now in New Jersey, it’s easier than ever, since “gay” indoctrination just became a state requirement. 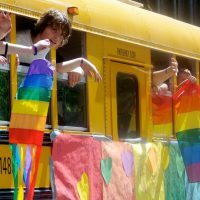 Beginning in the 2020 school year, NJ schools must teach that homosexuality and gender confusion are wonderful and normal behaviors with a legacy of brave heroes. This will be, of course, a bald-faced lie. The timing is ironic. Just two weeks before this deviance-mandate bill was signed by New Jersey’s Democrat governor, Mission America received a distraught email from a mother in north central New Jersey. She contacted us after reading articles on our web site, and provided infuriating details about her son’s private corruption by a teacher allied with GLSEN, the Gay, Lesbian and Straight Education Network.